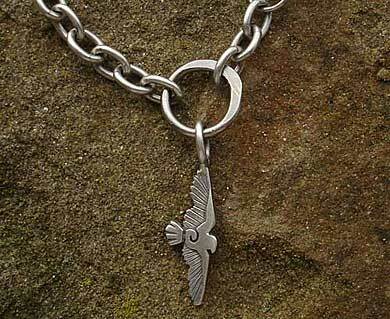 Silver Chain Raven Tribal Necklace : LOVE2HAVE in the UK! From our Raven collection of silver tribal necklaces, this particular beaded chain necklace features a stylish combination of silver chain and beads. 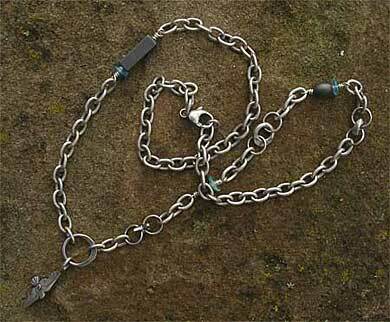 The silver trace chain is gently interrupted with forged jump rings, stars, hematite and apatite beads. They come in different shapes such as squared and rounded and are threaded randomly for that authentic handmade look with a tribal quality. 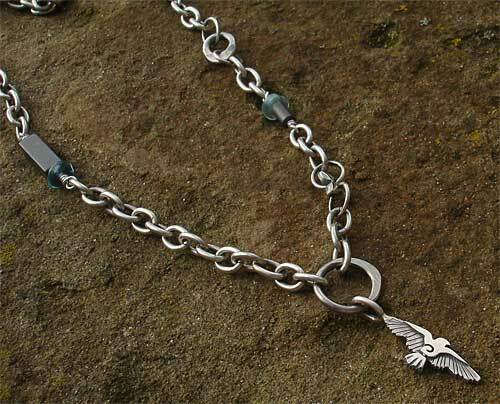 Together with its colour choice and modern, contemporary selection of beads, it features a small silver raven motif on its front attached to a silver loop. The Raven is a bird which became famous for delivering essential messages for Royalty, demonstrated in such TV series as 'Game of Thrones' for instance. We think this necklace is suitable for both men and women. Its length comes in a standard 18 inches, but it is also available in other lengths if requested.